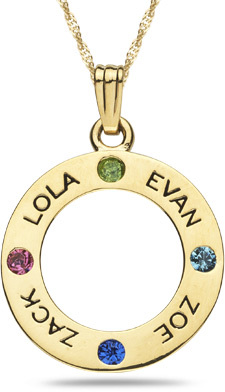 Engraveable and Personalized Gemstone Circle Pendant. Available in 1, 2, 3, or 4 gemstones (shown with 4 gems). Your choice of genuine, natural gemstones with engraved names. Pendant measures 18mm in diameter (just under 3/4"). With bale/hoop, pendant measures just under 1" tall (24mm). Set in 14k yellow gold or 14k white gold. 14k matching 18" singapore chain included. Available in longer lengths by request. Please Enter your engraving above starting with the first name you would like engraved, separated by commas. Max. of # letters per name varies based on # of names. 4 Engravings: 5 letters max. 3 Engravings: 6 letters max. 2 Engravings: 8 letters max. 1 Engraving: 12 letters max. Please enter your gemstone selection above when ordering starting with the first gemstone you would like, separated by commas. We guarantee our Personalized Gemstone Engraveable Circle Pendant to be high quality, authentic jewelry, as described above.